It’s time for the 2017 Employee Design Challenge! Every week, Spoonflower employees watch from the sidelines as you, our creative community, participate in the weekly design challenges. For one week out of the year, the roles are reversed and employees step off the sidelines and onto the design field to create a design for the annual employee design challenge. This year, employees were tasked with creating a design inspired by the theme Opposites Attract. From organic to geometric and sea to sky, our talented staff got right to work creating their design challenge entries. Want to learn more about the designs for this year’s challenge? Read on to see how four team members created their designs and don’t forget to vote for your favorite designs by Tuesday at 3pm EDT! [Read more…] about It’s time for the 2017 Employee Design Challenge! We're just one day away from finding out who will be winning this week's Design Challenge, made up entirely from Spoonflower employee entries! Read on to learn about the inspiration of four more designs and the employees behind them! Don't forget to check back tomorrow to learn who made the Top 10 and who is the lucky new owner of a custom chair reupholstered in their winning design! 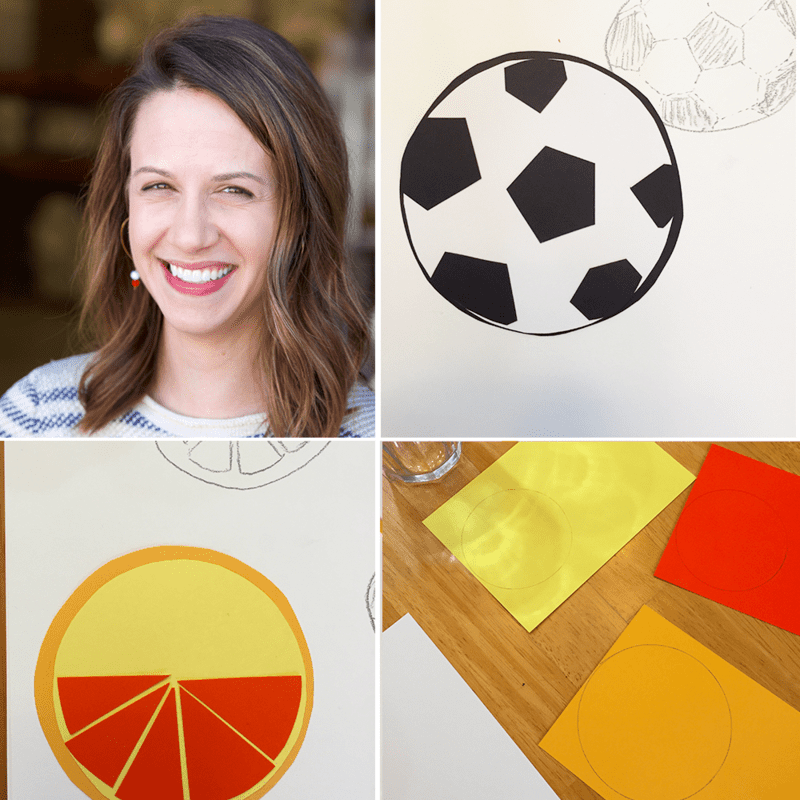 Oranges and soccer balls helped inspire Suz's paper cutout design for the 2016 Spoonflower Employee Design Challenge! Today marks the 5th day of our series featuring the designers behind the entries from our annual staff Design Challenge! Did you know that all designs entered in this week's challenge were created by the folks who bring your custom fabrics to life? Once a year, the tables turn and employees get to show of their design skills in a challenge made just for the them! Just joining us? Click here to learn all about this once a year challenge! A collector of odds and ends, Holly used her collection to help inspire this year's entry for the Spoonflower Employee Design Challenge. Have you voted for your favorite picks from this week’s Employee Design Challenge? Once a year, Spoonflower employees get a chance to flex their design muscles in a employee only Design Challenge. For many, this challenge feels like designer Christmas, with the office full of buzz and excitement. Throughout the past week we’ve been giving a behind-the-scenes look at the inspiration for each of these designs. 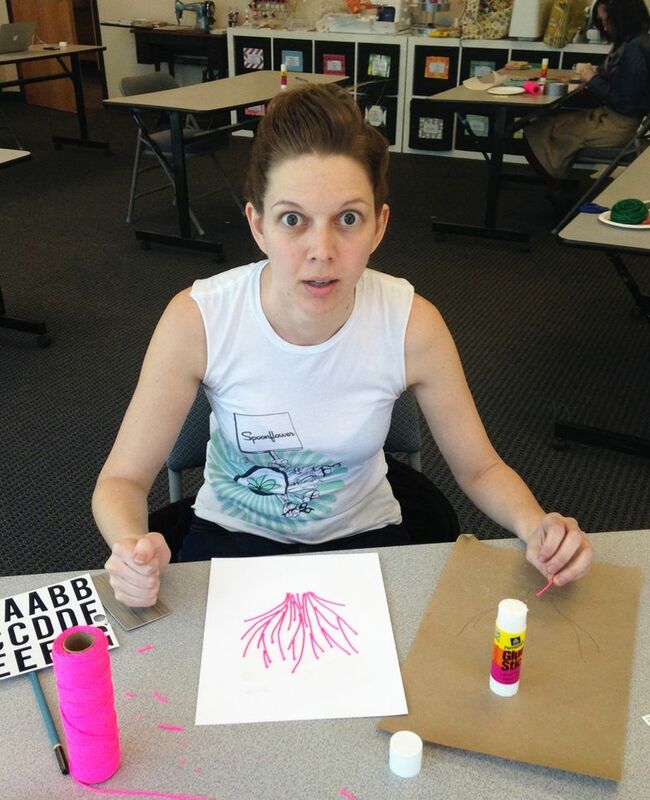 Read on to learn about four more talented Spoonflower employees! Textured, cut paper and a little editing in Photoshop was all Barbara needed to create her one-of-a-kind Spoonflower Employee Design Challenge entry! Have you been following along with our behind-the-scenes look into the designs created for the Employee Design Challenge? 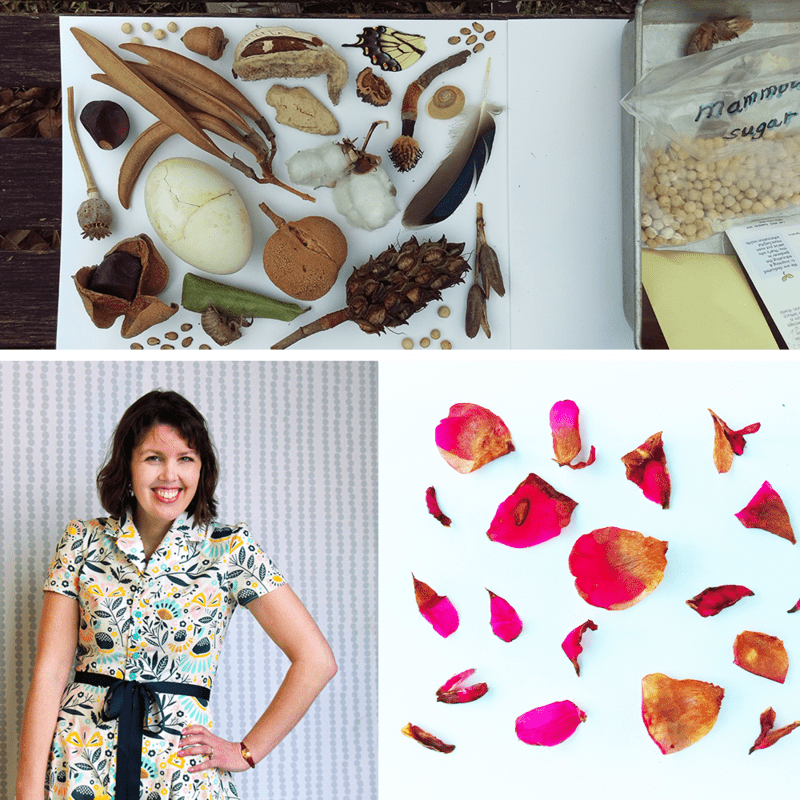 Read on to learn about three designers (Spoonflower employees!) and their designs entered in this week's Design Challenge! Inspired by a vacation photo from Kure Beach, NC, Lindy created her design with drawn vector elements. It's day 2 of Meet the Designers: Employee Design Challenge edition! Read on to learn more about four designs created by members of the customer service team, floor operations team, and a Spoonflower Berlin marketing team member. 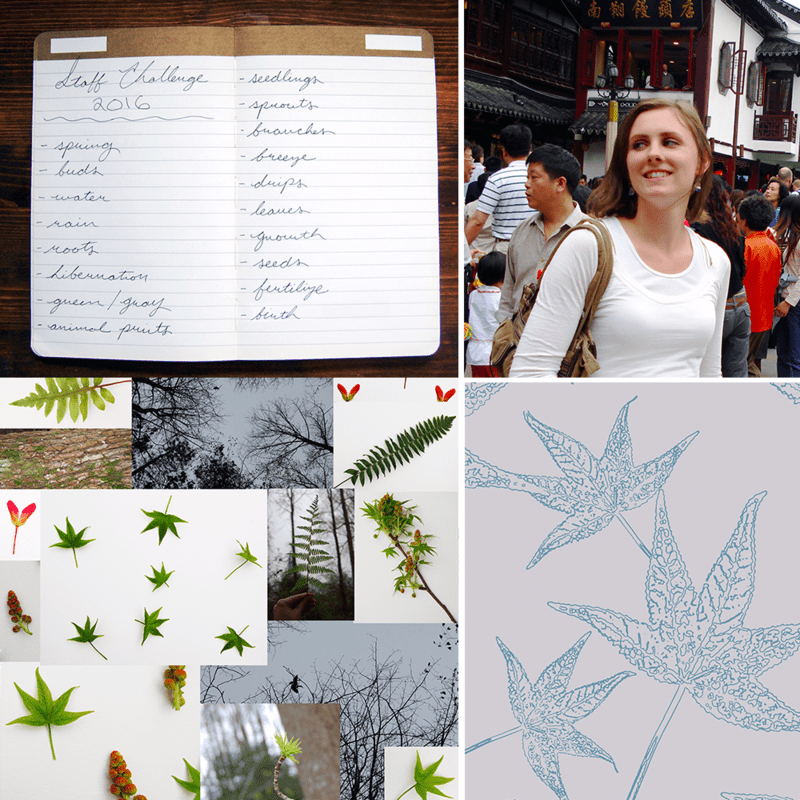 Inspired by her backyard, customer service team member Liz uses photos and Photoshop to create her design. 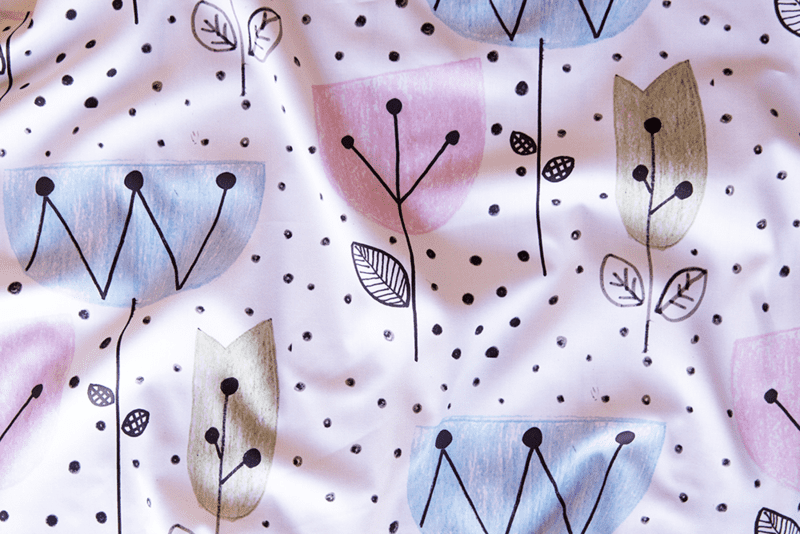 Announcing the 2016 Spoonflower Employee Design Challenge! 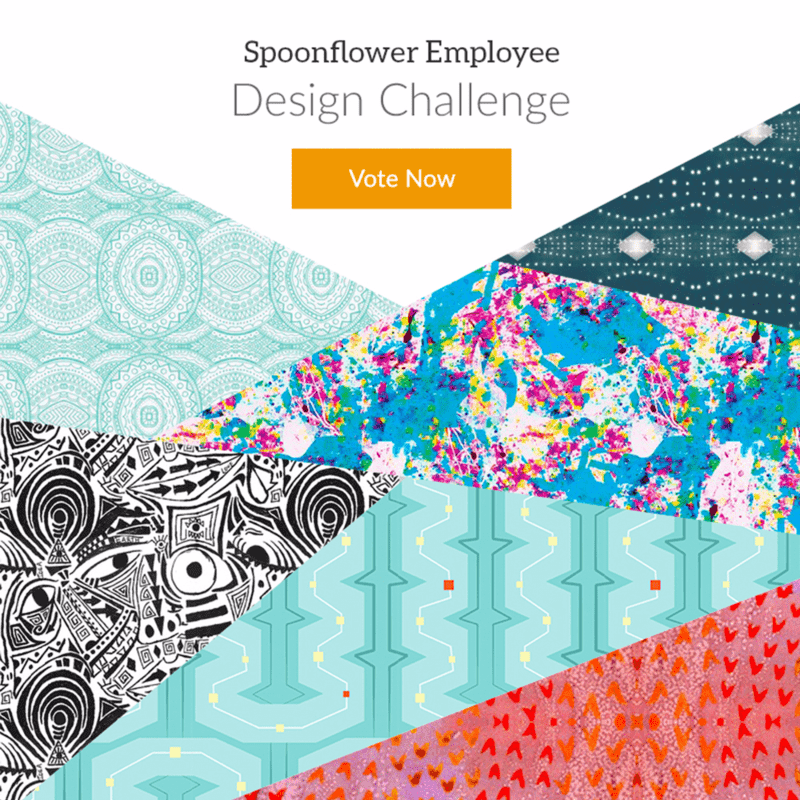 [Read more…] about Announcing the 2016 Spoonflower Employee Design Challenge! 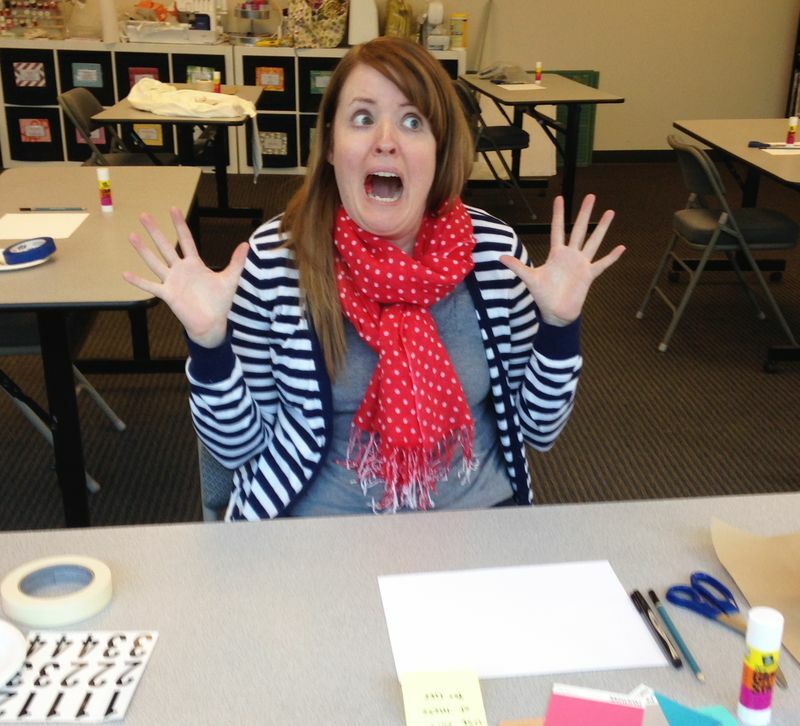 So much excitement has been in the air at Spoonflower HQ this past week! Folks have flocked from their desks, the print room, and the operations floor for a chance to be sitting pretty on a big, comfy chair upholstered with their winning design! 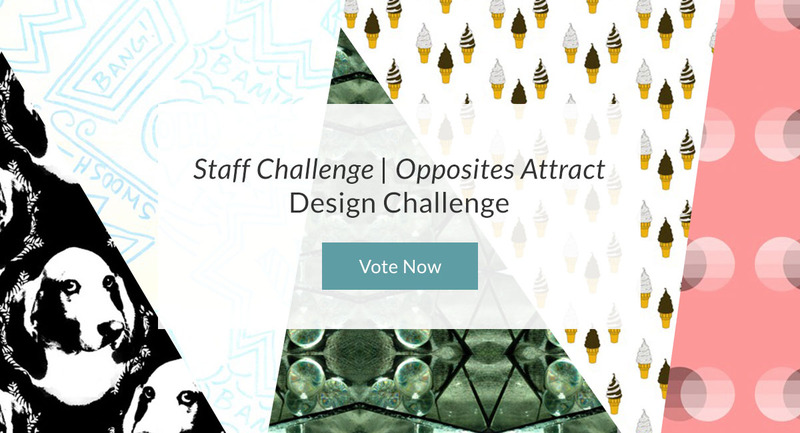 The voters have spoken – check out the top ten Staff Challenge designs and give a big high five to Eloisa Docton (Better known as natitys) for her winning design, Whimsy Floral Dots! It's amazing what you can do with a pen, paper and just 30 minutes! [Read more…] about Announcing the Top 10 Designs in This Year’s Staff Challenge! Vote in our 5th Staff Challenge!! The stakes are high, time was short, and the competition is fierce. 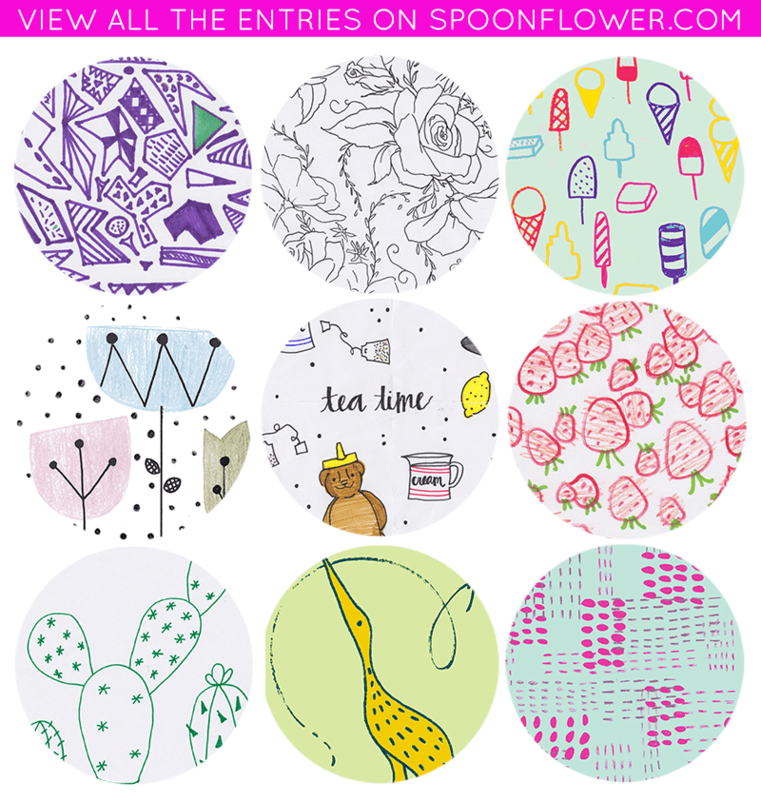 The time has come for voting in Spoonflower's annual Staff Challenge! Once a year, the tables are turned and Spoonies show their design prowess to the world in a special staff-only edition of our Weekly Design Challenge. Needless to say Around the Spoonflower HQ, we've been doing our finger push-ups and running seamless repeat drills in preparation for this year's challenge, perhaps our toughest yet––to create, upload, and enter a design into a contest in just 30 minutes! The winner of this year's challenge not only gets the glory of being voted to the top by our amazing Spoonflower community, but they'll also be sitting pretty in a custom chair from Select Furniture featuring their winning fabric design! Using just pen and paper and the good ol' crop tool and Spoonflower's Color Changer, these designs are sure to delight and inspire! What can you create with a pen, paper and 30 minutes? Kelly reacts to this year's challenge. In previous years we asked team members to create entire projects made from fabric they designed, the outcomes of which included 2012's LED-lit world map and last year's fully quilted Map of Spoonlandia. But we decided that this year we'd try something a little different to both simplify the competition a little and to up the ante. The 2014 Spoonflower Staff Design Challenge was Iron Chef meets Mystery Build: Employees had just 1 hour to come into the Greenhouse and create a fabric design using only the mystery materials provided. Designs were collaged and then scanned to upload onto Spoonflower. To level the playing field for the novice designers in our midst, we allowed very limited digital manipulation of the entries. Contestants could use basic cropping on the scanned images and, after upload, they were allowed to employ Spoonflower's color changer and repeat tools. At the end of an hour the entries were finalized and entered. Easy, right?! Janet gets an update on her time remaining!